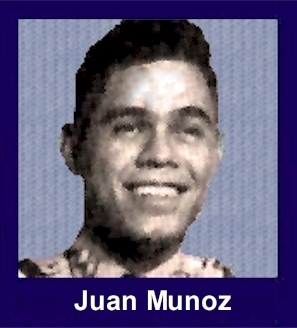 The 35th Infantry Regiment Association salutes our fallen brother, SGT Juan Munoz, who died in the service of his country on August 2nd, 1966 in Pleiku Province, Vietnam. The cause of death was listed as Small Arms/AW. At the time of his death Juan was 24 years of age. He was from San Antonio, Texas. Juan is honored on the Vietnam Veterans Memorial at Panel 09E, Line 99. The decorations earned by SGT Juan Munoz include: the Combat Infantryman Badge, the Bronze Star with V, the Purple Heart, the National Defense Service Medal, the Vietnam Service Medal, the Vietnam Campaign Medal and the Vietnam Cross of Gallantry with Palm Unit Citation. Juan was TDY to RVN in the spring of 1965. He was in the Shotgunner Program that provided volunteer door gunners for the advisors. Juan is buried at the Ft. Sam Houston National Cemetery in San Antonio. Plot Y 914. Ft Sam Houston National Cemetery (address 1520 Harry Wurzbach Rd.) is located on the North edge of Ft. Sam Houston. Ft. Sam is located in the central west side of San Antonio just west of exit 163 of I-35). I knew you to be a superb soldier, human being and above all from my conversations with you a loving and devoted son, husband and father. You had just returned from seeing your family that day. If only you had missed your plane and had returned a day late. May you rest in peace. To this day I still remember you, my friend.